Innovative notices help technology developers clearly communicate their policies to consumers. MPNs are designed to help tech developers clearly communicate their privacy and security policies to their users. Better enabling consumers to see those policies for a given piece of software is crucial, thanks to recent changes in health technology, said Principal Deputy National Coordinator for Health IT Genevieve Morris. "Compared to when the original model privacy notice was released in 2011, the consumer-facing health IT market now features a much larger variety of digital health technologies that collect information," said Morris in a statement. 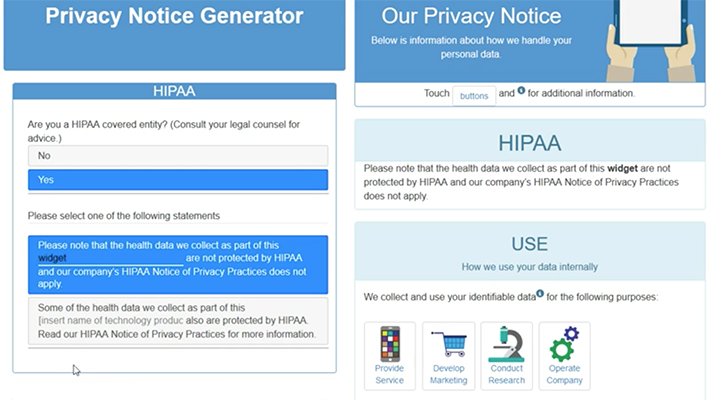 ONC issued a request for information in March 2016 asking the public what information about privacy and security practices health IT developers should disclose to consumers and what language should be used to describe those practices. It got 13 submissions from an array of stakeholders – developers, providers and consumers alike. Jason Cronk and Daniel J. Solove. They created generator features a side-by-side, live-updating view allowing application developers to see the MPN as they complete the app's sections, according to ONC. It shows developers which sections are completed or require more information. The MPN combines the clarity and simplicity of a nutrition facts-type label with visual icons that aid comprehension of the privacy concepts. Cronk and Solove were awarded $20,000. 1upHealth. This team's entry uses a side-by-side view including live checking of entered information to verify websites and phone number formats. The generated MPN allows for extensive customization, available in HTML, JSON, and Markdown formats. Detailed interviews and usability testing were held to receive consumer feedback. The team received $10,000. MadeClear.io. Its generator features expandable headers allowing developers to easily see how far they have progressed in completing the MPN, which uses alternating background images that help differentiate the sections and colorful icons that add context to the privacy language. The submission was awarded $5,000.